Google is pulling the plug on their social network, Google+. Users still have the better part of a year to say their goodbyes, but if the fledgling social network was a ghost town before, news of its imminent shutdown isn’t likely to liven the place up. A quick check of the site as of this writing reveals many users are already posting their farewell messages, and while there’s some rallying behind petitions to keep the lights on, the majority realize that once Google has fallen out of love with a project there’s little chance of a reprieve. To say that this is a surprise would be disingenuous. We’d wager a lot of you already thought it was gone, honestly. It’s no secret that Google’s attempt at a “Facebook Killer” was anything but, and while there was a group of dedicated users to be sure, it never attained anywhere near the success of its competition. According to a blog post from Google, the network’s anemic user base isn’t the only reason they’ve decided to wind down the service. A previously undisclosed security vulnerability also hastened its demise, a revelation which will particularly sting those who joined for the privacy-first design Google touted. While this fairly transparent postmortem allows us to answer what ended Google’s grand experiment in social networking, there’s still one questions left unanswered. Where are the soon to be orphaned Google+ users supposed to go? [Fribo] the robot is a research project in the form of an adorable unit that hears and speaks, but doesn’t move. Moving isn’t necessary for it to do its job, which is helping people who live alone feel more connected with their friends. What’s more interesting (and we daresay, unusual) is that it does this in a way that respects and maintains individuals’ feelings of privacy. To be a sort of “social connector and trigger” between friends where every interaction is optional and opt-in was the design intent behind [Fribo]. The device works by passively monitoring one’s home and understands things like the difference between opening the fridge and opening the front door; it can recognize speech but cannot record and explicitly does not have a memory of your activities. Whenever the robot hears something it recognizes, it will notify other units in a circle of friends. For example, [Fribo] may suddenly say “Oh, one of your friends just opened their refrigerator. I wonder what food they are going to have?” People know someone did something, but not who. From there, there are two entirely optional ways to interact further: knocking indicates curiosity, clapping indicates empathy, and doing either reveals your identity to the originator. All this can serve as an opportunity to connect in some way, or it can just help people feel more connected to others. The whole thing is best explained by the video embedded below, which shows several use cases. Hackaday.io has just turned two today and we couldn’t be more excited about how far we’ve come. What started out as a simple proof-of-concept, inspired by ye-olde idea of a “virtual hackerspace,” has truly evolved into a global playground for some of the best, brightest, and most creative minds you have ever met. It also became a home and the place to spend sleepless nights for many of us on the team, and we’re excited to share a few ideas on where we are headed going forward. But before we do that, let’s look at some data. We’re thrilled to report that over the last two years, Hackaday.io has grown from zero to a 121,158-member strong community, who have together created a total of 9,736 projects. 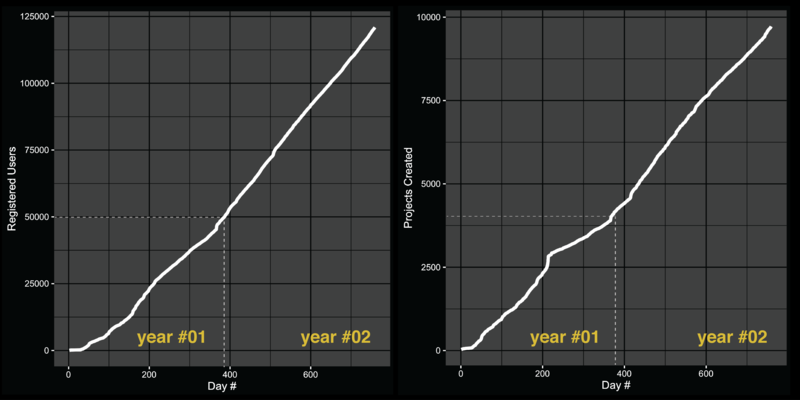 To put this in context, it is more than a two-fold growth from last year’s milestone of 51,838 users / 4,365 projects. And it doesn’t seem to be showing any signs of slowing down. Though these “vanity” metrics sure are a nice validation, the number that gets us the most excited is the fact that the 9,731 projects currently on the site have been created by a total 4,966 different users. What’s even better is the fact that 949 projects are a result of collaboration between two or more people. Altogether, a total of 7,170 different users have participated in the creation of the vast body of engineering knowledge currently residing on Hackaday.io. The most vulnerable part of any secure information system is the human at the controls. Secure passwords, strong encryption, and stringent protocols are all worthless if that human can be coerced to give away the keys to the kingdom. The techniques of attacking a system through the human are collectively known as social engineering. While most of us don’t use social engineering in our day-to-day jobs, anyone can fall victim to it, so it’s always good to see this stuff in action. Some of the best examples of social engineering come from unlikely places. One of those is [Matthew Pitman]. [Matt] is one of those people we all hope we never to meet in real life. He’s a repo man. For those not familiar with the term, [Matt] is the guy who comes to pick up your car, boat or other asset when you fall behind on your loan payments. Generally, these repossession agents are contractors, working for the bank or loan agency who holds the loan on the collateral. As you might expect, no one is happy to see them coming. [Matt] uses plenty of high-tech gadgetry in his line of work, everything from GPS tracking devices to drones. He calls his tow truck the Repo Ninja, and the interior is decked out with an internet connection, laptop, and tons of cameras. Even so, his greatest asset is social engineering. His 26 years of experience have taught him how to work people to get what he needs: their cars. Today marks exactly one year since we announced to the world the first product from our software lab – Hackaday.io. In what has been an incredibly exciting year for all of us, we evolved from a simple idea and a prototype to a truly massive community that’s making its mark on the world. Day after day, carefully listening to the invaluable feedback from our users, we have improved and moved forward, one line of code at the time. We still have a long way to go, but we’ll pause for a second now and reflect on how far we’ve come. Then get right back to fixing bugs and developing new features. It all started with a simple idea – building a better project hosting website. Though there are project and content websites galore out there, with new ones popping up every day, it all still felt too bland. We thought we could do better. After all, the medium is the message. The place where something lives sooner or later becomes a key part of its identity. So in order to prevent a dystopian future in which we’re all hosting our projects using the (fictional) Microsoft Maker Suite 2020 and simply don’t care, we started to work on providing an alternative. We quickly realized that we had a much bigger mission on our hands. Sure, a better project hosting website would be nice, but what we felt we really needed was something [Brian Benchoff] has been talking about for quite some time – a “virtual hackerspace.” Not just a place where you can post your builds once you’re done (and hope someone sees it), but a living, breathing community: a place where you can start with an idea and get feedback as it develops, find collaborators, iterate, and ultimately end up building something way more amazing than you would have accomplished on your own. This has been the aim of Hackaday for many years, but most of the collaboration was constrained to the limited space of post comment threads and biased by the editorial choice of articles and topics. With the introduction of Hackaday.io, we open up a space for anyone to unleash their creativity and expertise, and together, change the way people build things. Unfortunately, making bold claims about how we’re out there changing the world is pretty much a commodity these days. As most Web startups can testify, it doesn’t take more than a simple landing page with nice photography and some uplifting message for any arbitrary claims to appear credible. So instead of trying to convince you with words about how awesome the last year had been, we’ll just stick with the data. It is pretty obvious to everyone that the newspaper industry is in a tiny bit of trouble. They have thus far failed to reach the rapidly changing landscape of news, online news at that. They must do something to keep our interests up, or end up flailing on the ground. Microsoft and Google among others have recently entered the picture with solutions to the problem and some fresh eyes from a digital perspective. Leading edge tech companies enterend the picture with a plea from the Newspaper Association of America on how they can monetize content online through transactions or enhanced ad targeting. Microsoft submitted a news river system that resembles TweetDeck and Sobees. Google is looking at developing an extension of Google Checkout that would help newspapers charge for content through a micropayment system. IBM as well as Oracle have submitted proposals that look at the use of content management systems. So far the only shining example of the possibilities newspapers have to push things forward is Microsoft’s Next Generation Newspaper that pulls in all sorts of data such as RSS feeds, photos, videos, updates and news from across multiple news as well as social networks, into an information hub. So what does all of this mean for you? Newspapers might not be dead, they are in the hot seat and looking at the best of the best to help them out of the jam with intuitive solutions that meet today’s news viewing needs. What would you like to see newspapers do to engage you as an online news viewer? loszelos has added details to Nixie clocK. f4hdk has updated the project titled NPR New Packet Radio. karthik ram has added details to Leonardo - sketching robot. karthik ram has added a new log for Leonardo - sketching robot. loszelos has added a new log for Nixie clocK. karthik ram has added a new project titled Leonardo - sketching robot. Gerben wrote a reply on DIY Knit. Robert liked T962/T962A Controller Upgrade. Carlos Quijano liked AYTABTU - Discrete Computer.